Last week, I signed my family up for Geni, which is a great site that allows you to create a family tree for free (here’s mine), and then use that family tree as a small social networking site; like a mini Facebook, just for your family. Building out my family tree inspired me to finally get around to digitizing the tape recording I have of my (paternal) grandmother Rosie’s testimony before the House Unamerican Activities Committee (HUAC) in 1952. For those of you that care about such details, the cassette tape recording I have was copied from another cassette tape, which itself was recorded from a vinyl pressing which had been handed down since 1952. Needless to say, it wasn’t in great shape. I converted the tape to digital using my M-Audio box, and then ran it through a few noise reduction filters, and the resulting WAV and MP3 sound much better than my copy of the tape ever did, which is great. A little bit of background here for the few of you who may not have heard me ramble on about this at length: in 1952, my grandmother was a forty-seven-year-old immigration and civil rights attorney practicing in Los Angeles. 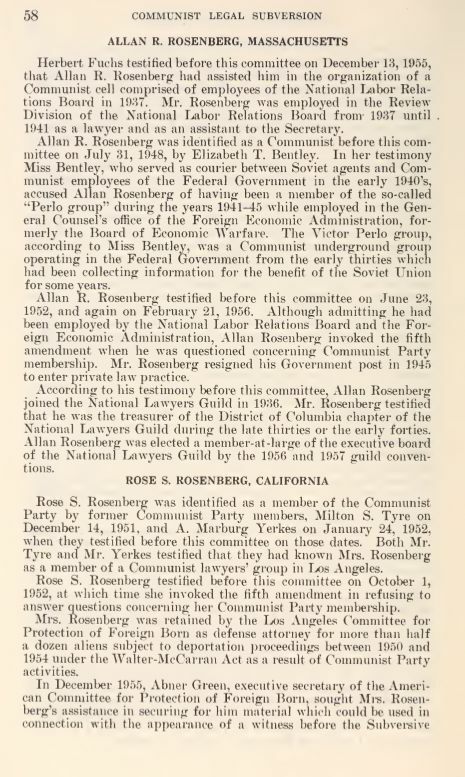 She was indeed an active member of the Communist party, and did extensive work with the LA chapter of the National Lawyers Guild and worked cases for the Los Angeles Committee for the Protection of the Foreign Born. She was a communist until the day she died, which was soon after I was born. The tape is a bit of a family heirloom and a pretty amazing piece of living history, so it’s great to finally have it saved as an MP3 and be able to share it here. However, even after the cleanup work I did, there were still a few parts of the tape that were unintelligible, so I went looking for a transcript of the audio. It took me a few hours of digging, but I eventually found the full archive of HUAC papers on archive.org. As it turns out, the printed copies of all the HUAC hearings, reports, and findings are all available at the Boston Public Library, but they’ve been scanned and posted online thanks to the Internet Archive. Further investigation turned up a number of reports referencing Rosie’s name (see the image right for a page from one report entitled “Communist Legal Subversion: The Role of the Communist Lawyer“), transcripts of her serving as counsel for other people brought before the committee, the transcript of her second testimony in 1963 (of which my father and I were unaware) regarding her trips to Cuba, and most rewardingly, the full content of HUAC’s 1952 investigations into “Communist activities among professional groups in the Los Angeles area”, which contains the transcript of our recording. This was particularly exciting, mainly because I have heard the tape many times since I was a child, and now I can finally understand certain parts of the audio (especially the parts at the end during which everyone is talking over each other and arguing about book burnings). Regardless, here’s one of my Grandmother’s better diatribes, and then the link to the audio. result of the force and violence of this committee. what the American Library Association said? Mr. Jackson. Is this in answer to the question asked by counsel? around, we would not have so much work to do. Pretty amazing (and shameless) stuff. Additionally, while I was searching for information on the HUAC hearings, I came across the website for a book written by Eric Etheridge called Breach of Peace, which contains photos and information about the 328 freedom riders who converged on Jackson, Mississippi in 1961, and there was a “Rose Schorr Rosenberg” listed there. A quick call to my father confirmed that Grandma did, in fact, go on a freedom ride in 1961, and when I contacted Mr. Etheridge, he sent me a link to the Mississipi Department of Archives & History, which has digitized all the records of the Mississippi State Sovereignty Commission. There, I found numerous photos and files referencing Rosie, including her mug shot taken on July 15, 1961 (shown right; also appears in the aforementioned Breach of Peace), the police report of her arrest, and a number of documents and fascinating articles, including ones showing that the DA in Jackson was working with the the folks over at HUAC in attempting to use her communist ties to discredit the riders. There was even one article written by Bob Novak which paints the entire civil rights movement as having sold its soul to the far left (sound familiar? ), and another AP article which mentions my grandmother and her traveling companion Jean Pestana by name, the title of which was “Jackson Cops Link 2 Riders to Red Groups“. I’m pretty excited by how much I found, and always suprised by how much information is available on the internet. I’ve asked my brother to dig out Rosie’s memoirs so that I can scan and digitize them for preservation, and maybe learn a bit more about what happened to her in Mississipi (she was issued a $200 fine and 4 months in jail, but I’m unaware at this point how much time she actually served). I’m also working on an audio project that will contain discussion of the tape by my family members with portions of the tape cut in. I think it will make for a compelling story.